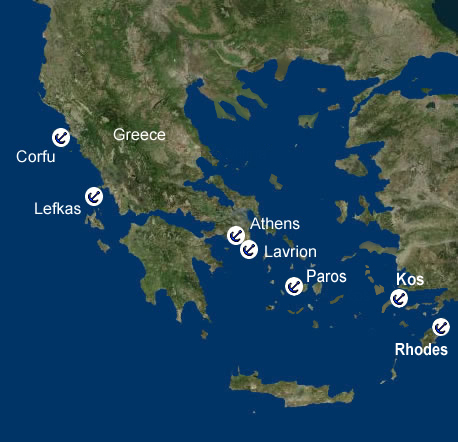 Day 1: Aegean Sea Marina Mandraki at Rhodes is a wonderful base for a sail around the Aegean Sea and the hundreds of islands in the Dodecanese archipelago. While at our base, enjoy the local atmosphere and get to know Rhodes' preserved medieval town. Day 2: Simi Town Sail to Simi Town and take in its pastel-colored architecture which make up the waterfront. The sands at Nos are close to the main port, while Panormitis beach is less touristy. To shelter from winds, head to Emporio cove. Day 3: Nisyros Island Palos (Nisyros Island) is a great place to stop off for inland exploration, particularly the active volcano and impressive caldera. Stroll dark, volcanic beaches, such as Gialiskari and Pahia Ammos, or Mandraki's white washed streets. Day 4: Kos Island Enjoy the medieval fortifications on Kos Island, including the impressive turrets belonging to the Castle of the Knights of St. John on one side of the harbor. For sandy beaches, sail to Kefalos, Marmari and Tigaki. Day 5: Agios Antonios Relax at Tilos Island's Livadia port and enjoy an ice-cold coffee in the bars or dine at the tavernas. Visit Kryas Springs or head inland to look around an abandoned village. Enjoy the secluded beach at Agios Antonios Marina, but watch the rocks, or swim in the clear water at Eristos. Day 6: Chalki Island Enjoy a cool drink at Nimporio's waterfront on Halki (Chalki Island), where you'll be met with a warm welcome. Find a gently shelving beach with free sunbeds at Kania Beach, shallow waters at Pondamos and a rocky coastline for snorkeling at Ftenagia. Try Yiali beach for a bit of isolation, which is only accessible by boat. Day 7: Rhodes Head back to Marina Mandraki (Rhodes).